Golden, Colorado - home of Coors and the Giordana GFNCS Golden Gran Fondo. I grew up on Coors beer. As a kid I couldn't get enough. Not to drink, but to collect and sell the empty aluminum cans. As a freewheeling California eco-friendly earth child my father took me up in the mountains to pick up empty cans tossed aground by weekend party goers. It was easy money for a kid, plus it helped save the planet which seemed like a good thing. Besides imprinting the wonderful smell of day-old stale beer in my mind for life, Coors helped me save money to buy my first road bike. So my trip to Golden is somewhat of a homecoming. Without Coors littered all over California I probably wouldn't have bought a road bike, started racing (including a Coors Classic) and wasted most of my life in the saddle. I owe it all to Coors. 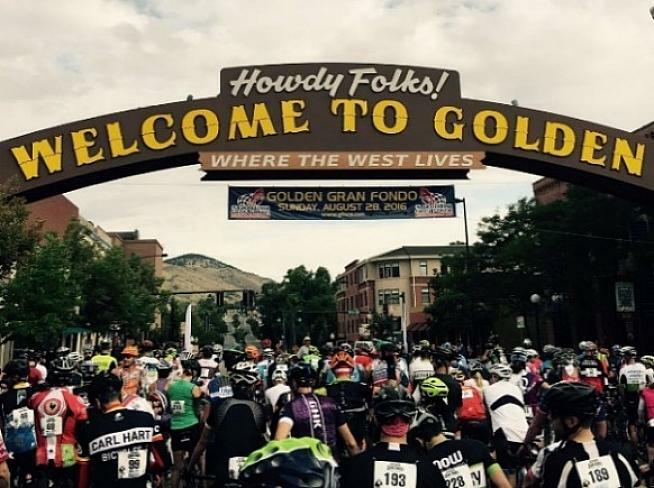 Golden has a rich cycling history including the US Pro Challenge, Coors Classic and the movie American Flyers, but more importantly it's a place you actually want to visit - bring your spouse or family for the weekend. So while I play bike racer in a fun, safe and rider-friendly event my wife can sleep in, enjoy a nice cup of coffee, check out local shops and charge all kinds of things on my credit card that I won't know about for a month. That's priceless, and believe me a lot more appealing to her than sitting in a dusty field waiting for me to finish some obscure USAC geezer race. Grand Fondo National Championship Series racing is simple - just sign up, time trial through a few timed segments, have fun on the rest of the ride and party at the finish. It's a lot like your average every day Saturday group ride - just more Pro. No license required and common sense rules fit in the palm of your hand rather than 236 pages of a USACycling rulebook. Ever wonder why USAC racers need to be told not to do illegal stuff like fight, write bad checks or cross a closed railroad crossing?? So my race day strategy is simple too. 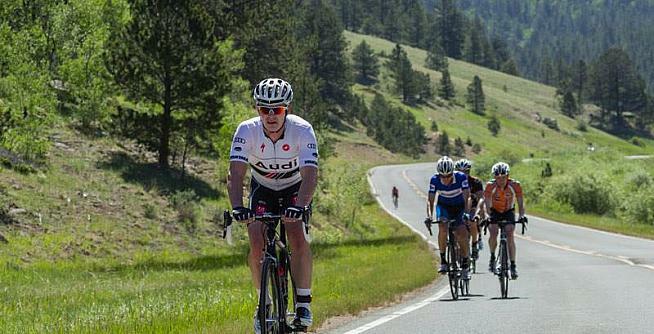 Although the ride is 85 miles long, the race segments only cover a dozen miles over four timed climbs. So I'll ride each timed segment at threshold, ease up, socialize and enjoy the scenery till the next one. When we reach the first timed segment the peloton still numbers 200. Everyone huddles together like lambs to the slaughter. But unlike a USAC race, people are smiling, chatting and not elbowing one another into the gutter. Colorful banners announce the start of the segment, the intensity increases and the field strings out. Two miles later the pecking order has been sorted out safely with riders now solo or in very small groups. That's how it will be for the day - for everyone. I quickly abandon my simple plan like a sinking ship. I have no choice. It's obvious there will be no "easy" today. With a shark tooth profile and 10,000 total feet of climbing in alpine conditions all the miles will challenge an old wheel sucker like me. It will be fun - like pulling teeth. Grinding my way up Golden Gate Canyon towards the second timed segment I briefly ride with Chris. He escaped from Texas last year and now enjoys the Colorado good life. While he eases up to save something for the timed segment I ride ahead. The segment is 3.7 miles, but the grade is no different than the previous 10. It's all uphill averaging 6%. So I keep pushing on the pedals all the way through the timed segment and beyond. The climbing continues onto hard pack dirt, cinder and loose granite marbles. Some dirt sections are too steep to ride while others a challenge to descend. Climbing one dirt hairpin turn at a snail's pace I notice a GFNCS "Slow Down" sign. It's got to be a joke - can't go any slower without falling over. Arriving at the third segment Chris catches me and rolls past in pursuit of glory on Tremont mountain. I'm just pursuing the finish line - in Golden. I try to stay with him on 12% grades by dancing on the pedals, but I've got two left feet now. At the end of the segment the route rolls downhill for a dozen miles on the Peak to Peak Highway. It's a fun 50mph descent on smooth asphalt with sharp hairpin turns. After climbing out of Pineville we roll downhill to the fourth and final timed segment. It's a 1400ft climb over 4.7 miles, but due to road construction the timed portion is now just two miles long. Yea! That's great news, till I realize we still have to ride up the entire 1400ft climb. Chris is just up the road so I try to catch him, coming within a few bike lengths before he crosses the timing strips and starts his race against the clock. I hang my head in misery and climb in a painful style, painfully, with much pain. After finishing the last timed segment, I start down three miles of dirt road. I say "Hi" to a mountain biker in a green medical marijuana jersey as I pass him. Punch-drunk with fatigue I can't help but laugh and think of alternative lyrics to the song Scooby Snacks - "Riding around pedalin' cranks, all wacked off on Scooby Snacks." Thankfully the last 10 miles is a downhill run into Golden and the finish in Parfet Park. Chris and I arrive together glad the Golden Gran Fondo is done and dusted. Food, drink and award festivities are already in progress for the shorter Medio and Piccolo Fondo riders. 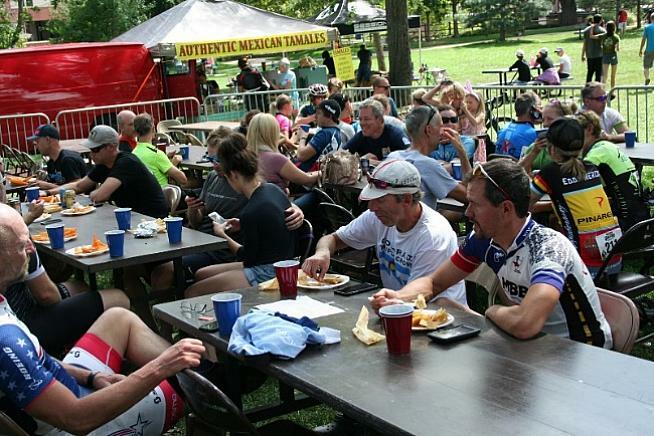 Grabbing some local handmade tamales plus a beer from Alpine Dog Brewing we relax while awaiting Gran Fondo results. In the end Chris has a great day completing the four timed segments in 54:35 for 15th overall, while I ride a tortoise like 1:01:52 into 38th. To put it perspective local racer Kip Taylor puts in the fastest time at 44:06, winning all four timed segments. Since that perspective is too demoralizing for me I seek solace in the details, the timed segment data, looking for a golden nugget. With some creative post-ride data mining, slicing and dicing I discover I'm the fastest rider named "John" on the 1st timed segment. I'll chalk that up as a W - or should it be a J? One way or another everyone's a winner at GFNCS Golden. 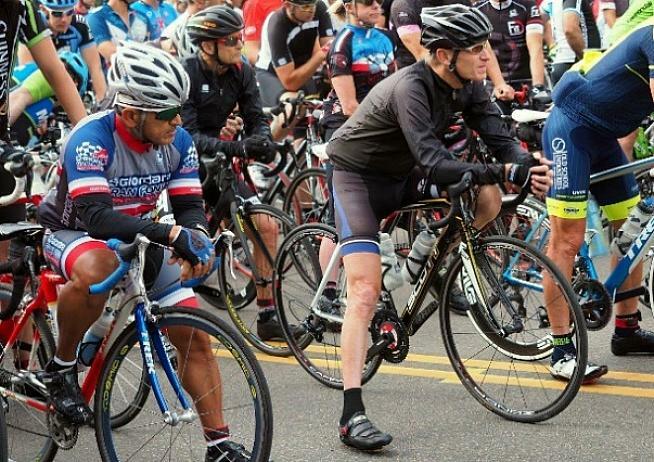 Gran Fondo grassroots racing proves that hard and competitive can coexist with safe and fun for everyone. At GFNCS races everyone is equal - no elitism. Everyone is scored - not just "those in the money." Everyone can race - even in a Pro Tour kit or cargo shorts with a sleeveless tee. In other words, it's inclusive rather than exclusive. That's innovation. That's the way to grow the sport. It's great to see promoters like Reuben Kline step up, innovate and make grassroots racing great again. Look for me at GFNCS in 2017. It's gonna be huge. Believe me.